This was my very first street in Venice. 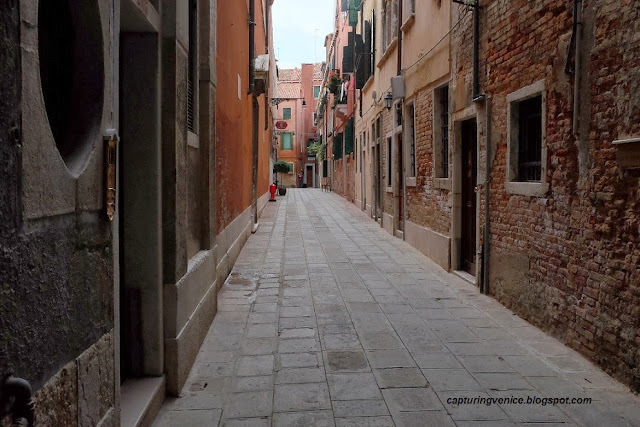 It's called Calle delle Muneghe, and it's located partway between Campo Santo Stefano and Campo San Samuele. I lived here briefly when I first arrived in Venice to complete my internship at the Peggy Guggenheim Collection, and I'd pre-arranged a month's accommodation at what was then a student dormitory for women, Istituto Ciliota, which was run by nuns. At the time, I had no idea about the ancient origins of the place in which I was staying: in 1485, the Scuola di San Rocco briefly moved to the oratory on this site, but eventually moved to their present location near the Frari. The oratory and some houses were given to the nuns of Santa Margherita in Torcello to build a monastery and church. The monastery was suppressed in 1806, and in 1810, the church was closed. In 1822, a priest, Don Ciliota, opened a school for poor local girls in the former rooms of the monastery. The site still contains a small single aisled chapel dedicated to Santi Rocco e Margarita. I remember the Istituto Ciliota as a comfortable but austere place in which to stay. Although I'd grown up in the Catholic church, I'd had a strictly secular schooling, and coupled with the strangeness of my first few weeks of being in Venice, I found the nuns who ran the institution rather intimidating. But the other girls who lived there were wonderfully welcoming to me, and they helped ease my first few weeks of displacement. I vividly remember the shock of my first meals at the Istituto Ciliota - I'd been used to rather spartan boarding school meals in Australia, and to experience an Italian style meal - with its multiple courses and simple but wonderful flavours - was an unexpectedly pleasant surprise. Sadly, I missed most of the meals because I was at work! I also remember the mad dash past the Accademia and up over the wooden bridge and through Campo Santo Stefano on some nights as I ran to meet the curfew when I'd worked late the Guggenheim, and the disapproving nuns as I raced through the doorway late at night. All in all, I moved into a share apartment in Dorsoduro at the end of the month with a huge sense of relief. Nevertheless, I always enjoy taking a walk down this street - I've since discovered that Calle delle Muneghe means 'Alley of the Nuns'. I understand that the student accommodation closed shortly after I'd moved out of the Istituto Ciliota, and the place was renovated in 1999 when Domus Ciliota opened as a hostel accommodation with 50-odd rooms for rent. Opposite the Domus Ciliota is a clubhouse for elderly Venetians. If you scroll back up to look again at the first photo above showing the Calle delle Muneghe, you'll see an empty chair outside the club. After I'd taken this photo immediately above (of the Domus Ciliota sign), I glanced over my left shoulder to find a stout elderly lady resting in the chair, nodding her head at me and obviously up for a chat. 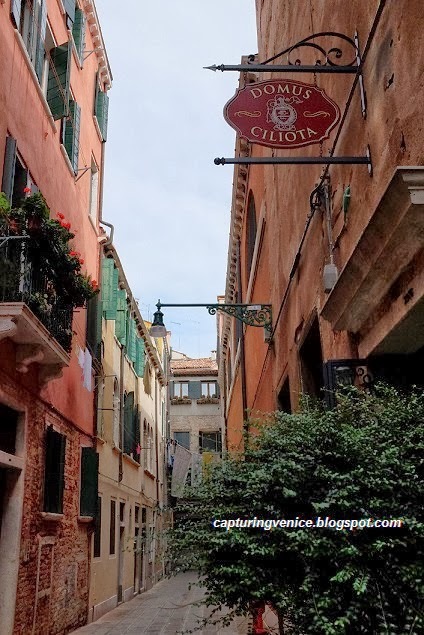 I love how elderly Venetians speak - there is a warmth and sense of formality all at once, and I am grateful to all my Italian teachers past and present who've enabled me to comprehend and express myself in Italian. The lady seated heavily in her chair told me how she came to the clubhouse every day for company, and how much more difficult it was for her to do her daily chores in Venice, because all the local shops had closed down. We could hear the sound of children from the nearby nursery, and the lady started to tell me a little about the story of this place. When I told her how I'd stayed briefly at the Ciliota when the nuns were still there, she was thrilled that I remembered a little of what this street used to be like. And when she discovered that I'm from Australia, she became emotional and told me a very personal story about how a young woman from Australia had once saved her life one cold night at the Piazzale Roma. I told her that that day was my birthday, and she spontaneously erupted from her chair to give me an enormous hug. My husband captured a photo of our embrace - it was a beautiful moment and even as I write this I am close to tears...to experience such an instant and intense feeling of mutual understanding and affection for a stranger was very moving, and I walked away from the Calle delle Muneghe with a feeling of gratitude for all that I've learnt and experienced because of Venice. This is a nice piece. I love the connection you made with the woman sitting in the chair. I feel a connection with her through your words. It's experiences like that which deepen your love for this city, and create such warm memories. And, because of the predicted 140 cm tide on Friday, my landlord moved me to this very Calle! I met some of the delightful folks at the clubhouse, and one of the nice blokes walked me around the neighbourhood, explaining about some of the Scuole that used to exist here. The Domus is now a touch more expensive than when you stayed there. I'd love to get inside and see more of this former, what .. convent, monastery? Our paths keep criss-crossing! I wish the rain would stop. I wish the rain would stop for you and Venice, as well. Our paths do keep crossing indeed! I've been looking at images coming through today and it looks extremely uncomfortable and difficult - not to mention the impact of all that water on the foundations of buildings and other structures. I hope the rest of your time in Venice becomes drier and you get to return to your original accommodations.